Speaking of planning, I am sketching out the next nine weeks of math instruction. We are beginning work over the next nine weeks of really identifying, writing and composing/decomposing numbers 11-19 using tens and ones. As I was at the Dollar Tree today, I grabbed three sets of (affiliate) foam sheets. I was thinking of a way to make simple groups of tens and ones (simple on myself) and these fit the bill. I will draw a complete group of ten using a sharpie and bingo daubers, and then cut singles using a paper cutter. Having different colors will allow me to have sets that are easy to use in small groups and for easy clean up. I wanted to make some ten frames that felt manipulative, and this will work nicely for my small group work! I’ve also made a set for myself with just the blank ten frame (no dots inside the frame). Any chance to help kinders “see” numbers in an organized fashion greatly helps them to improve their math skills, just like we teach number formation on a dice. 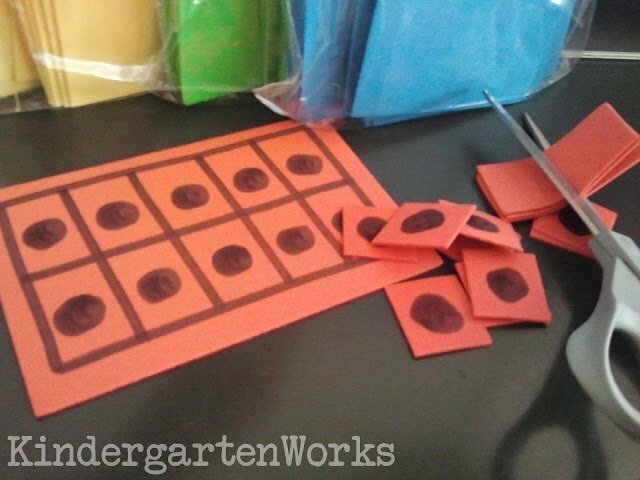 Now, you can have your kinders seeing numbers to 10 – and it will help with many Common Core Standards like K.OA.2 (knowing how many more to make 10). Bring on the algebra in Kindergarten! How else can you make manipulative-feeling ten frames? I tried laminated paper, but it just wasn’t substantial enough and was too hard for kinder fingers to grab… Share your ideas! I use egg carton cut down to 10s. Works great! I am going to use ice cube trays this year. Many of them at the dollar stores have 10 cube places in them. I like your idea of using foam for the ten frame. I’m thinking I would like to adapt it by making the counters in a different color so it would be easier for the students to see how many they have/need.